The Earth has seen dramatic events, lava oceans, a great collision that formed its moon, the filling of its oceans by impact boulders, the rising of continents with plate tectonics. Among these noisy events, life got started, perhaps many times and in many forms. The players, representing "soup ingredients", must find a sheltered refuge in order to start autocatalytic cycles and accumulate catalysts. Once they achieve templated replication, they can share their progress by swapping genetic material or becoming parasites or chimeras. 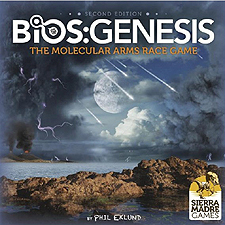 The game ends in the Cambrian Explosion, with the advent of multicellular life and the invasion of the land. Suitable for competitive, cooperative, and solitaire play.